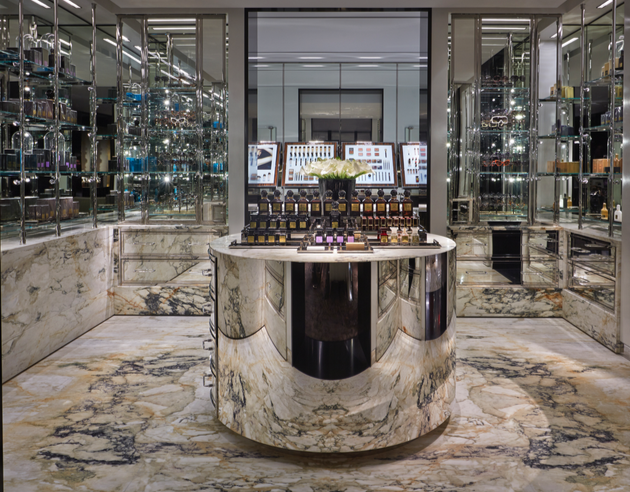 This flagship store, a collaborative project with Studio Sofield and located on the legendary Sloane Street in London, seamlessly brings customers into the upscale experience of browsing and buying the work of designer Tom Ford, whose brand name is associated with reserved yet classy clothing and accessories for the cultured, international, and sophisticated dresser. The store which showcases his work is no less of a designer masterpiece comprised of glass, carpet, and marble geometrically arranged with great precision and symmetry, and occasionally punctuated by celebratory gestures such as an incredible spiral staircase that smoothly blends organic form and futuristic texture. Upon entering the store, one is greeted by women’s handbags and accessories displayed in a highly glossy ensemble of hand-rubbed austere lacquer and dramatically veined Calacatta Paonazzo marble. The second-floor salon brings VIPs into a luxurious interior space demarcated by grey calf suede walls that surround an antique bronze fireplace. Menswear, including suits, shirts, sportswear, and shoes, is housed in four rooms of grey, glossy, hand-rubbed lacquer, and the sportswear room features freestanding makassar ebony wardrobes, coffee tables topped with Kenyan black marble and supported by legs of antique bronze metal—the room is perfectly symbolic of the way the interior of this store suavely combines styles and materials from different periods and places, embodying the very quality of worldliness embodied by Tom Ford. *This project was completed while employed at Studio Sofield.